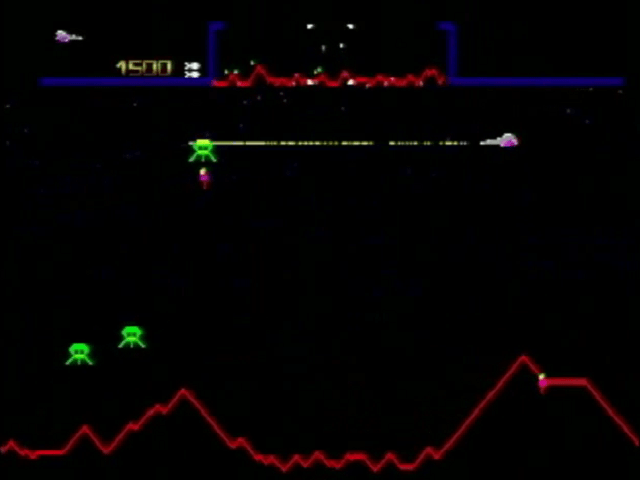 Defender is one of the few generally accepted arcade classics that I have very little experience with. I really can’t pin down why, and in that great mystery of human bias, my unfamiliarity with it caused me to decide I didn’t like it. We are indeed dumb animals at heart. So it was with great reluctance that I took Defender 2000 out of my Jaguar stack and plugged it in for my next review. It took a few sessions to get over my initial prejudice, but I soon came to the conclusion that Defender is really not a bad game. Defender 2000, however, is a different story. Let him go! ....Oh, wait! No! Wait! 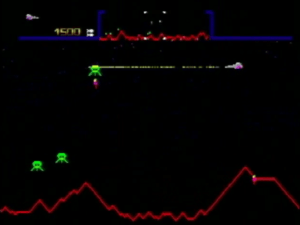 The original Defender was Williams’ (up to then known for their pinball tables) first video game success. It’s been loosely described as a side-scrolling take on Space Invaders; you control a spaceship flying over a planet besieged by waves of alien attackers. On the surface, helpless colonists are being picked up by enemy harvesters and flown to the top of the screen. Your job is to destroy the harvesters and then catch the now-falling colonists before they fatally hit the surface. Meanwhile, other alien types chase you, fire laser mines, and just generally make your life miserable. Defender’s main selling point is its side-scrolling playing field. The planet stretches out beyond the edges of the screen, and you can fly freely in either direction (eventually wrapping back to where you started). A radar monitor at the top of the screen helps you keep track of incoming enemies and endangered colonists, and your ability to instantly switch directions helps you quickly respond to threats as you detect them. Some vector-like line graphics provide the visuals, and a neat particle system sends blasted aliens exploding in all directions. A faithful recreation of the arcade game is this cart’s first mode, listed, appropriately, as “Classic Defender.” The 1980s line art returns with different colors for different levels, sound effects are appropriately bleepy and bloopy, and controls are tight and responsive. Button assignment is straightforward – forward thrust, fire lasers, and a screen-clearing bomb. The original arcade release had a fourth button to switch direction, and this option is included if you have a six button Jaguar Pro pad. The standard 3-button pad combines the buttons for throttle and direction. You’ll need to find and destroy all the enemies in a wave to proceed. I found myself neutralizing the harvesters first (probably because I was focused on them), but still had to fly around a bit to find the stray UFO or segmenting energy ball. Once you clear a wave, the surviving colonists are tallied up and added as a score bonus. This repeats, forever, with cycles of tougher enemies as you go along. It’s truly just a high score challenge. Defender Plus' warp gates are large and easy to fly into accidentally. 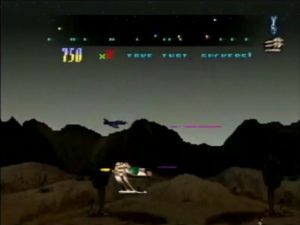 Like Minter’s previous remake, Tempest 2000, the cart contains two additional “modern” modes – Defender Plus, and the titular Defender 2000. These modes progressively alter Classic gameplay while retaining the basic concept. Defender Plus is pretty much Defender Classic with revised graphics and a new control scheme. The stand-alone button to switch direction has been dropped, and is now handled with left and right on the D-pad. This made more natural sense to me, and streamlines the controls for the better, though momentum is now a greater concern. 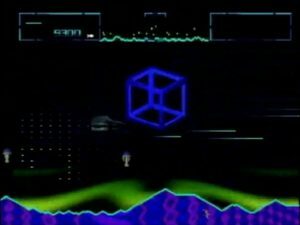 Graphically, the ship is now a 2D bitmap, and the surface of the planet is rendered in oscillating, psychedelic waves of color. Aliens are also animated images, now look like tiny mushrooms, and use darker colors that make them harder to see. On the gameplay side, Plus speeds things up considerably. Your laser attack is now very rapid fire, and you can rocket across the landscape so quickly that you’re apt to crash into aliens. This mode also introduces optional AI drones that fly alongside your ship, destroy aliens, and catch falling civilians. They do this quite well, and I was able to get pretty far in Plus just by holding the direction to accelerate and the trigger. Your speedy lasers plow an effecient path. A few levels in, you start to encounter new miniboss ships (large turrety things with shields) that require a little more caution to avoid and destroy. Warp gates also bounce you instantly across the landscape, and sometimes right into an enemy swarm. Defender 2000 iterates even further, and is where the concept starts to fly off the rails. In theory, it’s a stark graphical update to the original – much like the frequent HD remakes of today. The rather blank starfield is replaced by independently scrolling layers of background canyons, cities, or mountains. 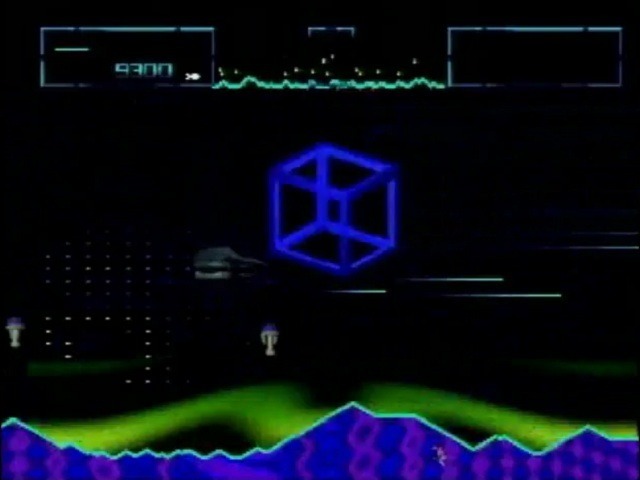 Every object is now a sprite, a thumping techno mix plays in the background, and various powerups are now added (such as the AI drone from Plus). Speed is quick and smooth, gameplay basics are unchanged. Artistically, I think it’s a bit of a bland flop, but it certainly shows how far gaming graphics have come along. Not only is the view tighter, but your ship floats to the center at high speed. Good luck seeing anything coming. Where 2000 fumbles is with its display. The view is too narrow. I’ve read complaints that 2000’s ship sprite is too large, but I think it’s more as if the camera was zoomed in too far. You can’t see what’s coming very well, and the speed gives you less time to react. One of the premises of Defender is that if a civilian gets carried off, they’ll turn into a fast homing alien that hunts you – you’ll never see these dudes coming. You also can’t fire into infinity here like you can in Plus, so you can’t use the radar to clear ahead of you. Basically, it’s a widescreen game confined to a tight 4:3 view. I think it’s telling then, that many of the powerups seem designed to offset this. You earn an energy shield that protects you from a few hits, that AI drone to scoop up falling civilians you missed, and even a second drone that zaps lightning out at nearby enemies. These powerups come pretty quickly into a wave, as does an abundance of extra lives, so the game’s more than manageable through most levels. That never stops it from being confusing though, with far too much happening on screen in later levels, and a limited window through which to view it all. I felt I was getting by more on the virtues of my auto-attacking powerup drones than any skill or reaction on my part. What have I taken away from this? First, original Defender is a pretty solid arcade game. It’s strictly a high score challenge – not my favorite style, but that’s okay – and does a fine job at combining reflexes and strategy. Plus is a decent upgrade. The AI drones help newcomers along, the faster pace and new enemy types are somewhat more exciting, but it does feel easier overall. A common Defender complaint is that it can be played simply by watching the radar screen, and Plus’ ungodly rapid fire lasers make this more true than ever. Defender 2000, however, is a step backward. Its new bitmap world is more technically impressive than artistically, and terrible framing makes it a burden to play. At least you get three versions for the price of one cart, and Plus and Classic are strong editions that fans will enjoy. 2000 mode, however, isn’t the showcase you would hope for. Graphics in all modes are crisp and fluid. Tremendous speed; maybe a bit too much for its own good. Plus adds some interesting changes to the formula. Cool easter eggs. Defender 2K is the anchor dragging this score down. The version that’s supposed to amaze the most amazes the least, and its restrictive view makes it very difficult to play. While it’s true you get the luxury of three games in one with this cart, it’s really two good versions of Defender, and one that’s not. Umm, the ship is a 2D bitmap in *every* version of Defender. The original certainly wasn’t a vector game. This is fair. I think what I was going for was trying to clarify the difference between a small collection of pixels likely drawn by the hardware on the fly (arcade Defender) and this larger, detailed image, probably created in an art program outside of the game, and moved around the screen as an object (Defender Plus and 2K). Sprite? Asset?